This Ferrari 212 Europa Coupe was first displayed on the Ferrari show stand at the 1953 Turin Motor Show. With a body hand-built at Vignale Carrozzeria in 1952, the current owners were motivated to restore chassis 0267 EU to its original design and color scheme. The car had been repainted and "fixed up" at various times in its life, but fortunately had never been completely apart. In spite of significant deterioration, it had not lost the evidence we would need in our endeavor to restore it to its original configuration. What we could not determine from this car, or what needed verification, was gleaned from our inspection of two of the other five 'low-roof' 212 coupes bodied by Vignale. Our goal for 0267 EU was to create a living document, demonstrating how Ferrari, and more particularly Vignale, hand-built this car. The trim details were the biggest surprise, and generated the most debate. 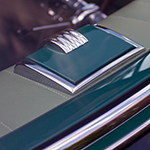 Uncovering original details under re-dyes and repaints, such as the olive green leather with dark green piping, evidence of stitching patterns on the interior panels, and the green metallic body paint under the over-sprayed windshield trim, led the way. Factory photographs reinforced our findings, and led us to other exterior details, such as the pin beading along the bumpers and side trim, and the front grille surround. Following our complete restoration, this low-roof 212 Vignale Coupe is precisely the car as it appeared on the Ferrari show stand at the 1953 Turin Motor Show. Our efforts were rewarded with an invitation to participate in the 2015 Villa d'Este Concorso d'Eleganza, where this striking Vignale Coupe was awarded Most Sensitive Restoration. Click image to start/stop slide show.